1 oz lot of 20. 1 oz lot of 25. 1 oz lot of 100. 1 oz lot of 500. 2017 Mexico 2-Coin Silver Libertad Proof/Reverse Proof Set. The Banco de México has partnered with APMEX to produce 500 of these unique two-coin sets featuring its most popular design. This beautiful APMEXclusive® set contains two 2017 Silver Mexican Libertad coins in both Proof and Reverse Proof finishes. Silver Libertads are Mexico's treasured coins and this Proof/Reverse Proof 2017 set continues the beloved series that began in 1982. The classic 1 oz size makes these Silver coins perfect for collecting and investing. The Reverse Proof finish accentuates the coin's already impressive design, presenting Mexico's iconic volcanoes Popocatépetl and Iztaccíhuatl and a myriad of historic Coats of Arms in a highly-polished sculptural relief. Contains a total of 2 oz of. Extremely limited mintage of 500 sets exclusive to APMEX. Comes housed in a wooden box showing the Winged Victory. 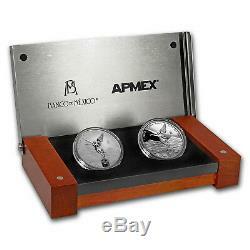 The box lid features both the Banco de México and APMEX logos. The set also includes a numbered Certificate of Authenticity from Banco de Mexico. This set contains the third release of the Reverse Proof Silver Libertad. Obverse: Features a sculptural relief design of the National Shield, encompassed by the legend "Estados Unidos Mexicanos" (United Mexican States), surrounded by different national coats of arms used throughout Mexico's history. Reverse: Depicts two key symbols of the Mexican people: the Winged Victory statue in the forefront and the Mexican volcanoes Popocatépetl and Iztaccíhuatl in the background. These 500 limited sets each come in a sleek box with an outer sleeve on the bottom that holds the certificate of authenticity. This magnificent 2-coin Proof Silver Libertad set is a popular choice not only because of its attractive design, but also its mintage at Casa de Moneda de México, the oldest mint in North America. Add this 2017 2-coin Proof Silver Mexican Libertad set to your cart today! This APMEXclusive® two-coin Mexican Silver set has an extremely limited mintage of 500 sets. This is the third year in a row APMEX has partnered with Banco de México to release these special sets. Not only does this Silver Libertad set have a limited mintage, but it also features the special Reverse Proof Silver Libertad, which is only found in this 2-coin set. Each Proof Silver Libertad and Reverse Proof Silver Libertad in this set contains 1 oz of. Each package is fully insured. There are no exceptions to this rule. The UPS Store, or similar third party drop off locations. If you do not receive the package directly from the common carrier, you agree to take all reasonable actions to assist in recovery of the package, including but not limited to filling out reports (and/or police reports) and providing all information needed or that may be requested to assist in recovery of the package. If we determine the package is lost or damaged, we file a claim. Failure to fully cooperate will jeopardize coverage that may be provided to you. For approved exchanges, you must follow all instructions provided by Customer Service, including carefully packaging the Product. Prices Q: How often are prices updated? Our listings remain live while pricing updates so you don't have to worry about listings being removed and reposted. Orders Q: Is there a minimum order amount? Orders of all dollar amounts are welcome. Q: Can I change my order once it's placed? A: Processing begins immediately upon completion therefore changes cannot be accepted. Q: Can I cancel my order? A: Once your order is completed it cannot be cancelled. Please be certain of your order before finalizing. Q: Is my package insured while in transit? Additionally, if a package is signed for by the apartment/complex building management, we do not assume responsibility. Q: What do I do when my package appears to be lost? There are no added commissions. Back Ordered Items Supply and demand problems occasionally occur in our business. From time to time, we have more buyers than sellers. If your Order(s) is cancelled, you agree you have full responsibility and liability to APMEX for any Market Loss. The term "Precious Metal" means Gold, Silver and Platinum along with the Platinum group of elements: rhodium, osmium, ruthenium, Palladium and iridium. Precious Metals are characteristically lustrous, ductile, rare and nonreactive. It is APMEX's goal that any disagreement or dispute be resolved expeditiously. If an amicable resolution cannot be reached, you agree that any and all disagreements and disputes between us shall be resolved in accordance with the following paragraphs: (a) Forum Selection and Governing Law. All such disputes shall be resolved exclusively in such federal and state courts, as appropriate, in that jurisdiction. You hereby consent to personal jurisdiction and venue in those federal and state courts for the purpose of resolving any disagreements or disputes between us and waive all objections to the jurisdiction of such federal and state courts. Any action arising out of or relating to these T&C shall be governed by, and interpreted in accordance with, the laws of the State of Oklahoma, without regard to conflict of laws principles. (b) Waiver of Jury Trial; Arbitration. If APMEX cannot perform any obligation hereunder as a result of any event that is beyond its control, APMEX's delay or failure to perform such obligation shall be excused and APMEX shall not be liable for any damages as a result of, or in connection with, such delay or such failure. McGee Avenue Oklahoma City, OK 73102, and all other notices and other communications to you shall be directed, at the option of APMEX, to the address that you provided to APMEX at the time of your registration. A decision or a failure by APMEX to take action with respect to any non-compliance by you of your obligations to APMEX or to insist upon strict adherence to any term in these T&C, does not affect the ability of APMEX with respect to any other non-compliance by you, and does not waive or limit APMEX's right thereafter to insist upon strict adherence to that or any other term, whether of a similar or dissimilar nature. The section headings are included for ease of reference and do not affect the interpretation or the scope of these T&C. These T&C are intended to be enforceable to the fullest extent permitted by applicable law. If any term of these T&C is held to be unenforceable for any reason, such unenforceability shall not affect the other terms of these T&C, and the term that would otherwise be unenforceable shall be enforced to the fullest extent that it would be enforceable. APMEX may amend these T&C at any time by posting the amended terms on the website, and such amendments shall become effective immediately. If you become aware that you may be required to make any disclosure of such information, including, without limitation, as a result of the receipt of a subpoena or other compulsory process, you shall promptly notify, in writing, APMEX and you shall cooperate, in good faith, with APMEX in obtaining a protective order or other appropriate relief, if any, with respect to such disclosure. The item "2017 Mexico 2-Coin Silver Libertad Proof/Reverse Proof Set" is in sale since Tuesday, October 24, 2017. This item is in the category "Coins & Paper Money\Coins\ World\North & Central America\Mexico\Mexico (1905-Now)".